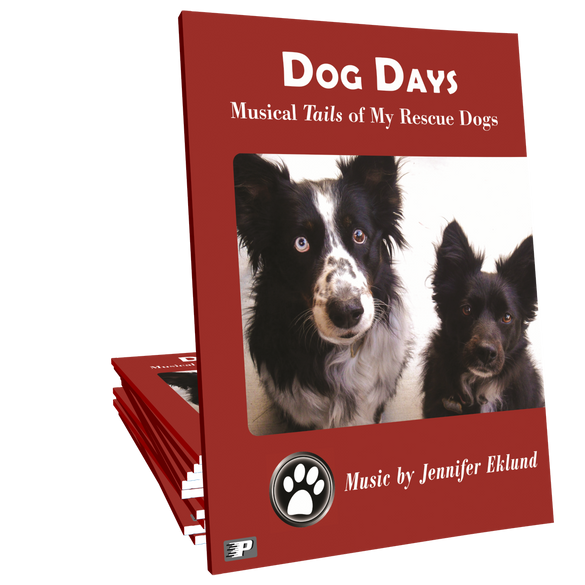 Dog Days songbook is a set of intermediate showcase solos by Jennifer Eklund that chronicles a day in the life of her rescue dogs. This is my favorite early intermediate book! I had one of my students buy THIS book because he loves the jazz music and this is exactly his style and wants he needs! I have several students who are playing in Dog Days. They really enjoy the pieces and I enjoy finding the pedagogical gems in them! I just have to say...almost all of my students want to play End Game! It is a hit in my studio! This book is full of fun, lyrical songs that my students love to play! 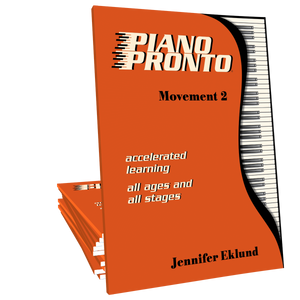 This book has been a hit with piano students. One student said End Game was the coolest song he has ever played. Fun songs while working on technique is a win-win! So many student favorites in the Dog Days book. I especially love the this collection includes different styles from super fun to sweet and lyrical. Students love them all! Bravo! Very nice set of music to go with a great cause. Great mixture of genres and loved the video showing just how to play each piece (very helpful to me). It was a treat to see one of the “Stars” of the music series as well. Excellent job of writing music that teaches and sounds wonderful to play! Such an excellent and varied set of pieces, Jennifer has really captured her dogs’ antics in the rhythmic structure of the pieces. The first piece, Morning Stretch is a very accessible intro. to the set and The Chase is so much fun with a fast section followed by broken chords.Will introduce the set to a very early intermediate this afternoon. Bravo! 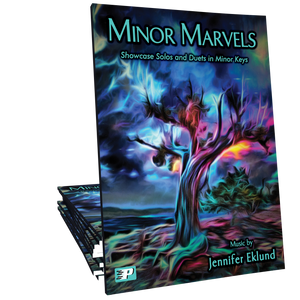 Jennifer does an excellent job of compiling different pieces to reflect the theme of the book… The fact that part of the proceeds go to the animal shelter is a bonus. But most of all, students and I simply love her music !! It’s just a lot of fun to learn these pieces. Great music! I just had a high school student return tonight after having the book for a week. She’s only been playing for a year. I suggested the Morning Stretch (beautiful but seeminly simpler). She came back with a different piece (The End Game) completely learned!! It sounded great!! I love the idea of a portion of the proceeds going to help an organization working with dogs needing homes. Thank you Jennifer for helping this girl feel successful and even better about her piano progress than before!! Thank you! This book has completely reignited one of my students’ love of music. We started off with “End Game”, after reading so many positive comments about that piece. She LOVED it! She has since played “Oh Snap!”, and is currently working on “Morning Stretch”. The music is so appealing to students. Thank you for writing such motivating music! 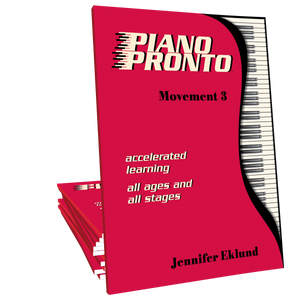 I have recently purchased a bunch of Piano Pronto books to try out with my students after seeing so many wonderful reviews. It was hard to chose one to write a review on, as I am loving all of them! I have used this book with a couple students, and they absolutely LOVE the music! The arrangements are cleverly composed to sound much more difficult than they are. Students feel so accomplished and their faces absolutely beam! They also enjoy reading the stories behind the songs. As a teacher, I am equally excited to see their reaction and can’t wait to explore the many beautiful arrangements I’ve purchased! Great job Jennifer Eklund!! Another win for Piano Pronto. My students LOVE this arrangement of the theme from “Morning.” They especially enjoy reading the stories included. It’s an excellent motivator in my studio. Piano Pronto is a permanent addition to my studio library. Another winner! Love the harder version of ‘The Chase’. My students love this book! It’s a wonderful collection of pieces to satisfy every musical taste. Great for recitals!